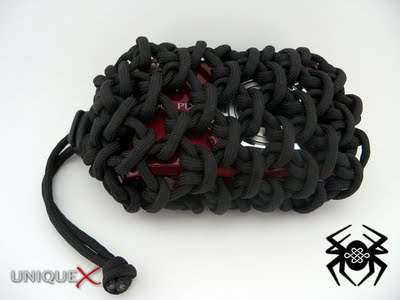 I first saw this tying design on Stormdrane’s blog where he created a pouch and a koozie using this method. Ever since I first saw it, I wanted to create one of my own but I never had a need for it until I purchased a new camera. I needed a new camera for better photos for the blog and had been looking at the Nikon CoolPix for a while so I bought it. I received a good deal on the camera, but with every good deal there are drawbacks, the price didn’t include a camera case. It didn’t matter because I knew I wanted to make my own anyway. CLICK THE CONTINUE READING BUTTON TO VIEW THE REMAINDER OF THE ARTICLE. To tie this design, I used a series of connecting Cow Hitches, a.k.a. Lark’s Head Knots. 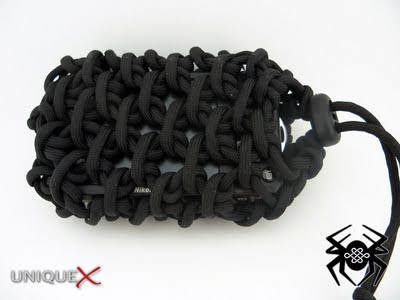 The design requires two strands of paracord, one for the cinching loop (approximately 1 foot) and one for tying the bag (approximately 15 feet). You will also need a cord lock, I chose to use one that was purchased from Lighthound, but you can grab an alternative cord lock from Wal-Mart. Once you’ve gathered the materials, you are ready to start tying. It is fairly easy to tie the bag once you get started, and since Stormdrane has already produced the instructions, I won’t go into it. His post shows photos of a pouch and a can koozie that was tied using the same method that I used. He also included a printable instruction sheet to get you started with this tying technique. He even showed how the bag is ended by using a series of Half Hitches to form the bottom. When tying a pouch for items which can be scratched easily, like the camera, you may want to use a substitute that is approximately the same size which won’t be harmed by the tying process. The size and space between the Cow Hitches is important for the look of the bag and you should remember that gaps that are too large will allow the contents of the bag to be damaged. I tied my bag with Cow Hitches that are kind of close so that the screen of the camera won’t get damaged easily, but it can be damaged. 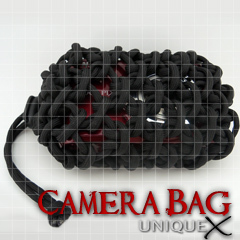 If your camera bag has to be carried to places like sporting events, you may won’t to choose another tying technique. A great resource for Half Hitching variations can be found in Creative Ropecraft by Stuart Grainger. Also, Stormdrane has another post which shows a pouch tied using Half Hitches. Labels: "camera bag", "cow hitch", "half hitch", "lark's head"